The Marketplace Committee partners with area retailers to host exclusive shopping events and ongoing partnerships throughout the year, often with a sales discount to JLW shoppers and a percentage of total event sales donated back to the League. Along with individual shopping events, JLW Shops! proudly hosts the Georgetown Shop Around each spring. This event features generous discounts exclusive to League members. Join JLW Shops! 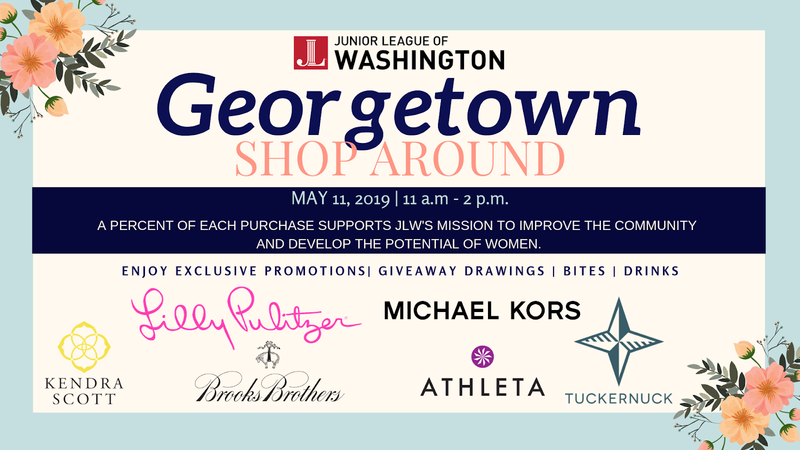 on Saturday, May 11, for a one-day retail extravaganza, the Georgetown Shop Around! Our premier shopping event of the year brings together Georgetown retailers for a full-day shopping experience with exclusive, in-store discounts and perks for members, friends, family, and guests. Additionally, the League will receive a portion of all sales donated back to support our philanthropic mission. Stop 1 – Kendra Scott: We start our shopping at Kendra Scott with bites and sips – 20 percent of your entire purchase goes back to the League – and giveaway drawing is at 11:30 a.m.
Stop 2 – Brooks Brothers: As we make our way around Georgetown, our next stop is Brooks Brothers, where you will receive 10 percent off your purchase while the League receives 15 percent with a giveaway drawing at Noon. Stop 3 – Tuckernuck: Our next stop and partnership is Tuckernuck where you will receive 10 percent off your purchase, the League receives 10 percent and a giveaway drawing for the store’s fabulous clutch is at 12:30 p.m.
Stop 4 – Lilly Pulitzer: Always popular Lilly Pulitzer will have a giveaway drawing at 1 p.m., each purchase over $150 will receive a gift and 10 percent of your purchase will go back to the League. Stop 5 – Athleta: Our newest partnership Athleta is offering 20 percent off one full price item, 10 percent back to the League and giveaway drawing at 1:30 p.m. Final Stop – Michael Kors: We round out the shopping with our final stop and official host of the After Party at Michael Kors from 2-3 p.m. Ten percent will be given back to the League and giveaway drawing at 2:30 p.m. Passport holders in attendance are automatically entered into each raffle upon arrival, no purchase necessary. By visiting all the stores, attendees will receive two extra raffle tickets to win amazing prizes at the After Party at Michael Kors. Passports can be purchased for $5, in advance online or the day of at JLW Headquarters during sign-in.